We’re looking for a film maker to produce short documentary films about graduate makers activities during In:Site festival. In:Site is an annual festival showing contemporary craft made by graduate makers. 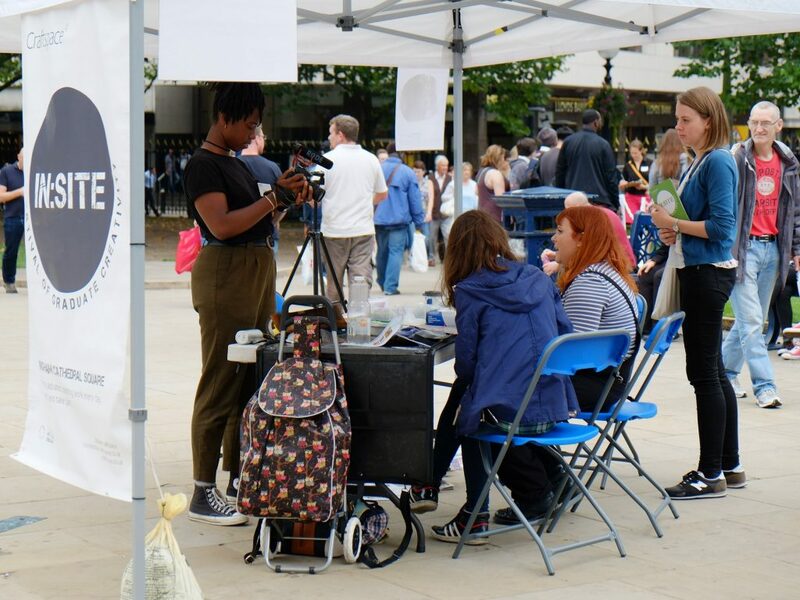 The festival takes place over the first week of September in Birmingham Cathedral Square and is produced by Craftspace, a charitable organisation creating opportunities to see, make and be curious about contemporary craft. We’re looking for an enthusiastic emerging film maker keen to gain experience in interviewing and documentary film making. We welcome creative ideas and would like someone who is confident working in an outdoor public space. Include interviews with artists talking about their practice, site-specfic pieces and their experience at In:Site festival. Craftspace can support with supplying interview questions. Capture public participation viewing and/or making pieces. Edit the films and ensure they are in a suitable format to be uploaded to the Craftspace YouTube page. Film maker fee: 3 hours filming/1 hour editing per day for one week 3rd – 7th September = £250 (£12.50 hour) Film maker must supply their own film making and editing equipment. If you are interested in developing your film making experience, please complete an application and equal opportunities form by 1st August 2018. Please email your completed forms to info@craftspace.co.uk. Download the Film Maker Job Role here. Download the Application Pack here. Download the Equal Opportunities form here. Applicants must be 18 years old or over by 31 August 2018 to apply for In:Site Festival. All staff are required to familiarise themselves with and follow the code of conduct. Applicants must be available at the times they have indicated in their application. Applicants must be familiar with the Risk Assessment and the Safeguarding policy (this will be available onsite). Applicants must be willing to talk with Craftspace before In:Site and ideally attend a briefing meeting on 22nd August 2018. Be responsible for their own safety and belongings.